I just find surviving marketing kiosks amazing. We had a talk the other day on a Gameboy one, and I am green with envy. 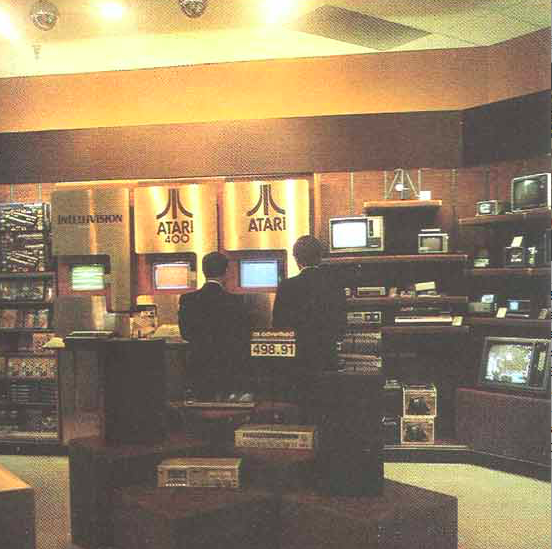 Here is a photo of another awesome one from the Atari 8 bit computer line. It would be great if it still exists somewhere. Notice Pac Man on the screen. The bottom seems to be actual inventory. The back wall is blank, and the carpet is new, so this looks like a studio portrait, like its going to prom. The kids are way too respectable. Must be marketjng to parents. Can anyone identify the games on the kiosk? Edit: It does still exist. Here is a video of someone playing Star Raiders on it. Another old display. Poor Odyssey really comes out bad with Speedway as the attract game vs warlords, football and space invaders. I really enjoy the box art of these three consoles. Playing games on a Kiosk back in the early 80's was awesome. Before the days of special made demo's. You got the full experience on the kiosk itself. Sure, games were simpler, but that was a good thing. You could see if it was simple fun you wanted at home. I remember playing the Intellivision version of Popeye that way. That's how I decided I was going to get it. Lol. Poor Speedway had no chance against those other titles. They should have put in KC Munchkin or something. Not sure what year this photo is from though. 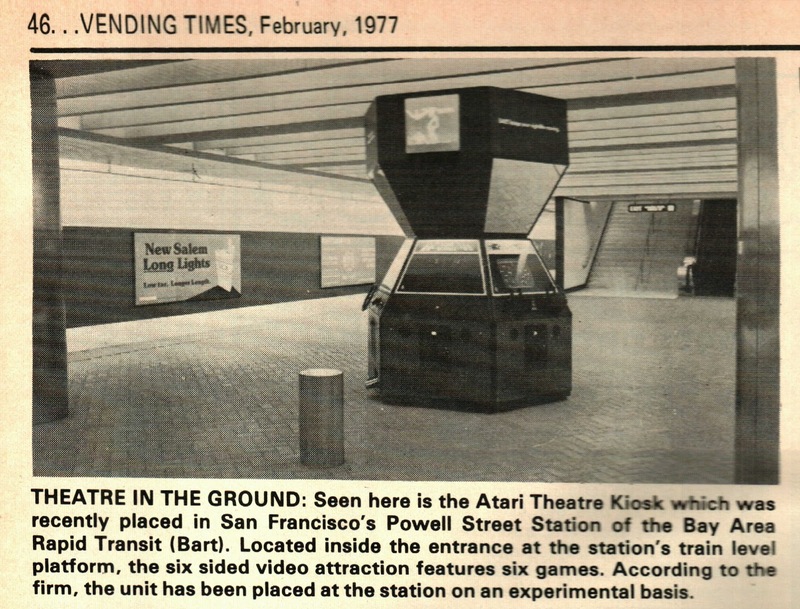 I remember the kiosks but not one nearly as grand as that. Growing up I remember they usually had a 2600 and Intellivision you could play. Scotland you mentioned in another post you had a 7800. Do you have a 5200 as well? I've always wondered which was better. My instincts tell me the 5200. Marriot Guy's http://www.videogameconsolelibrary.com has reviews, and neither shines. The libraries tend toward rehashed titles, each has disappointing controllers, etc. However, there are homebrews for both systems that might be fun. Honestly, even though the systems are still very affordable, I would rather invest in one of the many home computers of the time, or buy homebrews for the 2600, then invest in either of these two systems. That's my own bias,,so others might disagree. I have a 7800 because its been in the collection since it was purchased at retail long ago. I just prefer other ways to play 2600 games, and only have a small library of 7800 games. I have a couple of 2600s, but a Sears Video Arcade II is my goto console right now. 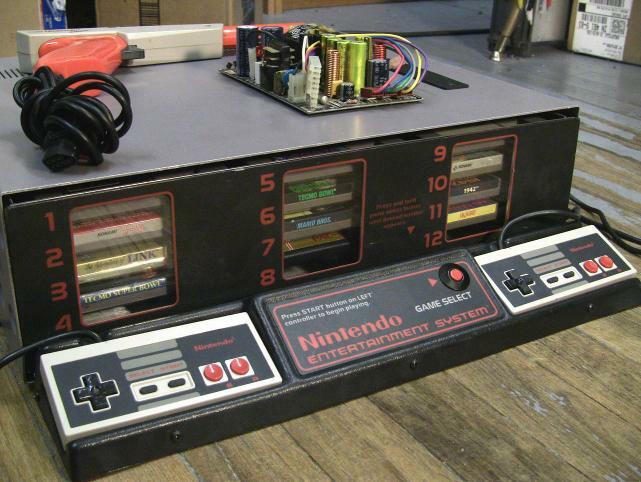 Here is an NES display. I was about to say these kiosks must have been a mainly American phenomenon, but I definitely remember that NES kiosk from back in the day ! A store, maybe Montgomery Wards, selling the Intellivision, Atari 400, and the Atari 2600. So....much....woodgrain. Good times. When cassette tapes ruled the world. Beautiful pics Scotland. I enjoy them more then the finest paintings. There was a movie called "The Toy" with Richard Pryor and Jackie Gleason. I loved that movie back when I was kid and still do. In the toy store there's a scene with a Intellevision display. I still watch that scen on YouTube sometimes. I also remember the kid having an arcade game in his home. Can you believe it? An actual arcade game that he owned in his home for personal use. Talk about being rich, huh? That's about as rich as it gets. Now in 2016 I could probably buy that arcade game for my home for $300 and I don't even want it. How sad. Still those pics you shared captured a moment in time that I will always appreciate. Thanks. Here is an old one, and an interesting idea. 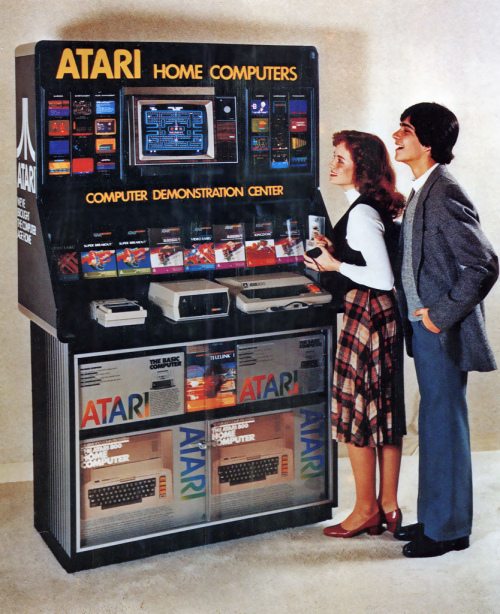 It looks like an Atari home console *arcade* unit, with six put together. You can also see the secondary audience viewer tv high up. The slanted surfaces almost look mirrored, which would be an interesting twist to playing, but I think its just a photographic artifact.